I fixed one of my mid-century modern dressers giving it new life. I'm looking forward to using it in my new bedroom! I fixed the second mid-century modern dresser. It took much longer to bring this one back to life. But now it's done and it looks great! 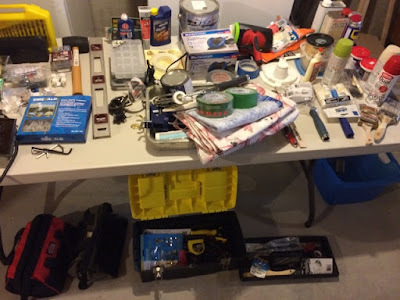 I went through my tools and hardware and got rid of many things. I'm left with a toolbox with room for more tools and a medium size storage bin for the items that don't fit in the toolbox. I washed the drawers for the two dressers I fixed last Sunday and Monday, and let them dry out in the sun in an attempt to rid the wood of a musty smell. I used Murphy's Oil Soap and the sun. I think it worked! I cleaned out the front entrance closet. I found shoes I completely forgot I owned, and I like them! I tried to find new pulls for the drawers of my mid-century furniture. Unfortunately, I ruined the old pulls by letting them soak in cleaner for too long. I haven't found any that would fit yet. Apparently, the standard sizes don't fit on older furniture. I visited with the condo landlord to give him my paint colour choices. The place is definitely not as nice looking as my current home, but I can probably make it look nice. I think I may have come up with a less expensive and much easier solution to my drawer-pulls situation! I'll just try spray-painting them. They're discoloured because of their years and me leaving them soaking in cleaner for too long. But I have all 18 pulls for the 3 pieces of furniture. None are broken. They're just ugly now. So hopefully the spray-paint will resolve that. I have to admit that it's a bit of a challenge not to get into the mindless consumerism trap with the move. I get excited about a new place and want to decorate it with new stuff. I really like home-decorating. However, I don't want to buy a bunch of things that I'll regret later. So I'm talking myself down from purchasing things. Do I really want this lamp? This rug? This coffee table? This chair? This table? If I get them, will I want to pay to have them moved in the future? If not, will I want to go through the trouble of getting rid of them? Will they add value to my life? So far, I've bought a sofa-bed and a pair of blue curtains for the living room that I fell in love with as soon as I saw them. As I've mentioned, I sold and got rid of many of our furnishings. I plan on repurposing some of my current furniture. For example, since I'll be using the mid-century modern dressers in my new bedroom, the dressers that I'm using at the moment will serve as a sort of TV console in the new place. I like that the drawers will nicely hide the remaining DVDs and video games. And since I bought a sofa-bed for the new living-room, storing the linens in the drawers will be practical. There are some pieces of furniture I currently own and love, but I'm not sure I'll be able to use them in the new place. So I can either get rid of them now, or pay to have them moved and figure out later if I'll be using them, and how. When all is said and done, I want to make sure that I use or love everything I own. I don't want to go back to having more than what I can use or anything I don't really enjoy. I think I may end up with some pieces of furniture that will be used only as decoration, like the mid-century tall-boy cabinet. I don't think I'll have anything to put in it, but I don't want to break up the set. I think it's beautiful. So I'll keep it, for now. See... It's a struggle for me too at times!